Twilight Zoo Chiangmai Zoo is opened for every visitor to come to see many kinds of animal in the day time. Naturally, most of animal would come to eat and hunt at night. The animal life style at night is the interesting thing to stydy. Chiangmai Zoo has the opened area which consists of the plenty forest with a real natural environment and 30 kinds of night animal at least. The concept of visiting night animal life is from an idea that we would like to present the new interesting and innovative zoo to every visitor Recreation and Activity Center In secial events, very useful for everyone. Children Zoo Natural education room for children and whole family. Before being Chiangmai Zoo today, founded by Mr.Harold M. Young, an American missionary, who kept some wild animals at the foothill of Suthep Mountain to be private zoo. In 1995, Chiang mai City Organization allowed this private zoo to expand the area to 24 acres. In 1974, Mr.Young passed away, the Zoological Park Organization took over on 16 June 1977. 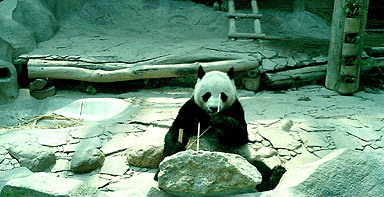 The Royal Forestry Department allowed the zoo to expand again in 1989 to 200 acres. Now Chiangmai Zoo has 7,000 wild animals. Chiangmai Zoo is located on Suthep Road near by Chiangmai University. Enclosure by flower gardens and cover the area of 531 rai. Here is where you can experience the most enjoyable from variety of animal show as well as Giant Panda from China, Cape Fur Seal and Humboltd Penguin.